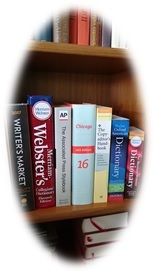 For word usage, I typically consult all three dictionaries. Though they are usually consistent, it does happen that there are discrepancies, sometimes with the order of definitions and sometimes with nuances of usage. In the latter case, I’ll note the differences in marginal comments along with a recommendation. When I mark up style changes in a manuscript, I like to cite the style guide reference in a comment at the first occurrence. Subsequent markups of the same style issue simply make the correction without further detailed explanation, though I may occasionally put a reminder of the style guide section number. For fiction, I’ll be paying careful attention to your voice and your style. My goal will be to ensure that this is consistent and coherent throughout the work. I also consult Internet sources as needed. Such resources are particularly helpful with modern slang, archaic language, new usage trends, foreign words, and the like.